A little over a year ago, Julie L Moreland, a long-time owner and lover of Siberian Huskies and a tremendous supporter of Rescue, died in a tragic accident. In honor of her, her husband Richard has made a generous contribution to SOS-SRF and requested that the group reserve the money to keep alive her memory and her dedication to helping the breed she loved. 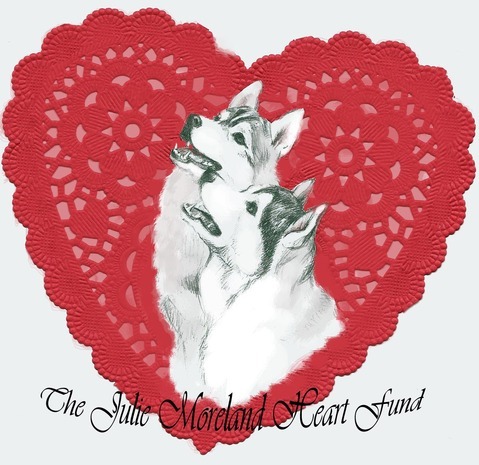 Toward this end, SOS-SRF has established the Julie L. Moreland Heart Fund, to be used exclusively for Heartworm cases where costs exceed our generally accepted guidelines for reasons SOS-SRF deems valid. This could be, for example, because of medical complications or because the rescue group has been faced with a large number of Heartworm cases and is experiencing difficulty in raising sufficient funds to cover them. Any Siberian Husky rescue faced with a costly heartworm case or multiple cases can apply for funding using the application posted on our website. Thank you for all you do for the breed we love and for your support of our cause.